This potent combo will shine in practice and the studio. 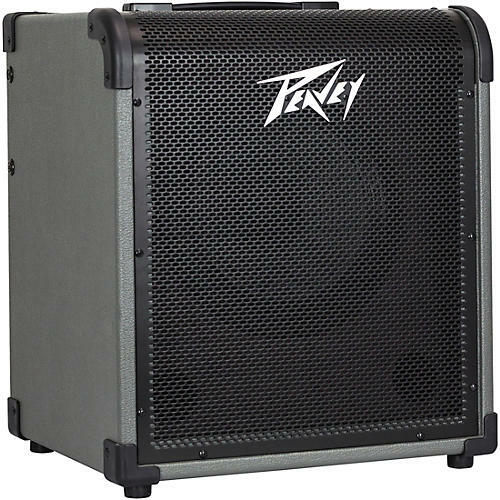 The Peavey MAX 100 bass combo amp delivers more bass in a space-saving package. With 100 Watts of power that includes DDT speaker protection and a 10-inch heavy-duty woofer, the MAX 100 is great for plenty of gigs and rehearsals. Another Peavey exclusive is the patented Trans Tube circuitry that offers you a gain boost. The EQ section includes a 3 band EQ and buttons for punch, Mid-shift and Bright. The MAX 100 also includes a unique psycho-acoustic low end enhancement that adds low end without taxing the speaker, a testament to Peavey's technology driven philosophy. Rounding out the features are a built-in chromatic tuner and 1/8" jacks for phones output and aux input. Also included is an active Silent DI output, a powered speaker output and a direct 1/4" output. A tuned, ported enclosure with slanted baffle for greater projection. Also there is an effects loop.